This week's discovery of an Earth-size planet orbiting a star in the Alpha Centauri system — the closest to our own solar system — may have you eager to find out more. You could wade into the vast reaches of the Internet, or you could reach into your pocket and use an app. The app offers an easy-to-use interface that leads users on a logical path of discovery. The main menu includes a listing for Exoplanet News that includes links to original sources, and users also receive push notifications for breaking news. Each planet in the database includes a concise description that explains its significance in laymen's terms. For example, the entry for Alpha Centauri Bb reads in part: "It is the nearest exoplanet to Earth and also the lightest exoplanet ever discovered orbiting around a sun-like star." But Exoplanet's creator, Hanno Rein of Denmark, is no amateur. An astrophysicist at the Institute for Advanced Study in Princeton, New Jersey, he studies extra-solar planets and Saturn's rings, while keeping his app updated. Each exoplanet listing also includes interactive visual tools that offer in-depth information, including animated orbital paths and 3D views from within the Milky Way where you can zoom into specific planets or zoom out to view other galaxies. When you move to another planetary system, you can see the night sky as if you were standing on that planet. Perhaps the most compelling feature for space enthusiasts is Exoplanet's night sky view, which uses augmented reality to show an exoplanet's location relative to the user's position by pointing the phone at the sky. Exoplanet's Sky View showing new planet relative to user position. Exoplanet also provides an exhaustive list of filters to view groups of planets, such as "only those in the habitable zone" and "only those detected by pulsar timing." Rein has included reference materials for beginners under the heading Exoplanet Basics, which includes thorough discussions of detection methods. But he has also included advanced features for fellow scientists and students , such as the ability to generate and print. Advanced users can easily generate correlation diagrams. The search for a habitable planet will continue — Alpha Centauri Bb is outside what astronomers define as the habitable zone, meaning a planet may exhibit the properties to support some form of life. Meanwhile, space apps such as Exoplanet keep searchers up to date. Exoplanet is available for $3 in the App Store. Android users will have to look elsewhere. Rein has no plans for an Android app. " If I start developing an Android version of my app now, it would not be as polished and slick as the iPhone counterpart," Rein wrote on his blog. Android users can try Southern Stars' SkySafari for $3. (It's available for iOS as well.) 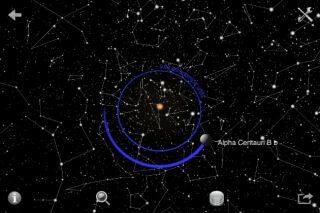 The app focuses on stars rather than exoplanets, but is considered one of the best general-purpose astronomy apps. This story was provided by TechNewsDaily, sister site to SPACE.com.